Set your own temperature for each room, set detailed programmes for weekdays and weekends, … or operate your thermostat remotely and save energy with ONE climate control. Finally, a simple solution for climate control. 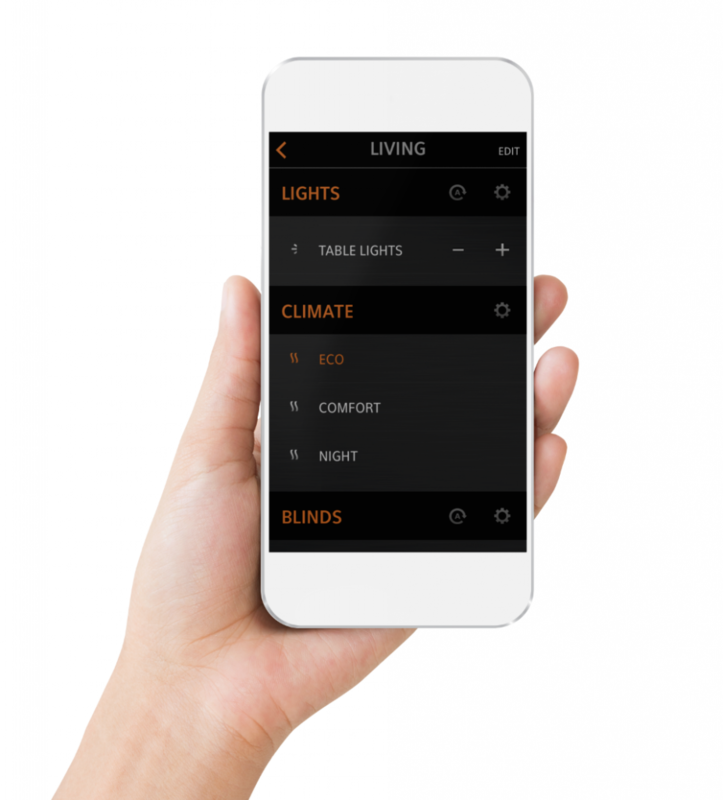 ONE Smart Control carries out all the tasks in your smart home. Your sun blinds, heating and ventilation systems work together seamlessly. Without any complicated programming or installation. Control the temperature, heating times and more, no matter where you are. Are you back from holiday unexpectedly early? Before getting into the car, switch on your heating, using your smartphone. It will be lovely and warm when you get home. Do you want to make sure you always feel comfortable in your room? ONE Smart Control is a multi-purpose comfort sensor. It controls the heating and the ventilation. It switches on the lights when you enter and monitors the room when you are absent. Do you prefer the bathroom and living room to be warm in the morning? And do you want the heating off in the bedroom? This is easy to programme with your app. Individual room control allows for individual temperatures in each room. In a room with large windows and plenty of natural light, often the sun provides sufficient heat. One push of the button and the blinds or curtains slide all the way open. This leaves you to enjoy the maximum benefits of the radiant heat from the sun. By using a comfort sensor, this is done entirely automatically. And what about the weekends? Is your daily routine different during weekends? ONE Smart Control will take this into account. You can vary the settings for weekdays and weekend days. So, even if you get up an hour later at the weekend, your bathroom will be nice and warm. Away on holiday for a week? Set your home to eco mode. The settings for your heating are turned down and only the most essential energy is used. Do your weekdays always follow a set pattern? You rise at 6.30 am, take a shower, have breakfast, go to work and return home at 6 pm. You want your heating to keep to this cycle? Do not waste energy, simply set up the cycle once-only. It will increase your comfort and reduce your energy bills. By not constantly heating your entire home, you will definitely save energy. Your heating is only on in the places where it is needed. Insight into your energy consumption also makes it easy to intervene and understand what is happening with your energy.